One of the core benefits of democracy is citizen’s feedback to the government. This has to be fair, transparent and regular. 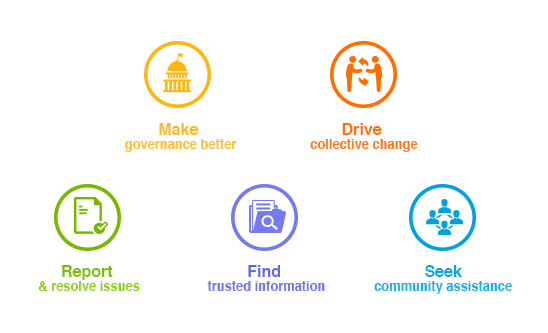 LocalCircles’ objective is to make governance better and participative for common citizens. Hence, every year it asks millions of citizens registered on the platform to weigh in on the performance of the central government. The comparison of third year’s review with last year shows a marginal decline. 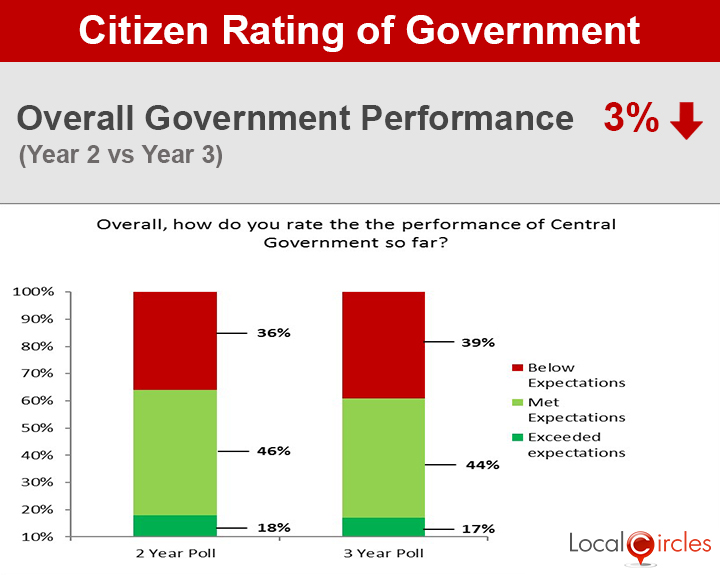 Around 44% citizens this year said that government met their expectations; this is marginally down from 46% last year. Dissatisfaction has also risen – last year only 36% citizens said the performance of the government was below expectation. This has gone up to 39% in the third year. While last year 18% said that the government had exceeded their expectations, this year 17% say that. Overall, as change hasn’t come fast enough for most people, there is a decline in citizens rating of the government in most areas as compared to last year. If we combine met expectations and exceed expectation there are 61 % who are satisfied with the government. Around 59% of the citizens who polled believe that the government will fulfil the promises made in its pre-election manifesto, which is a fairly high trust factor. Government has also been able to handle the Parliament and opposition benches better in the third year. 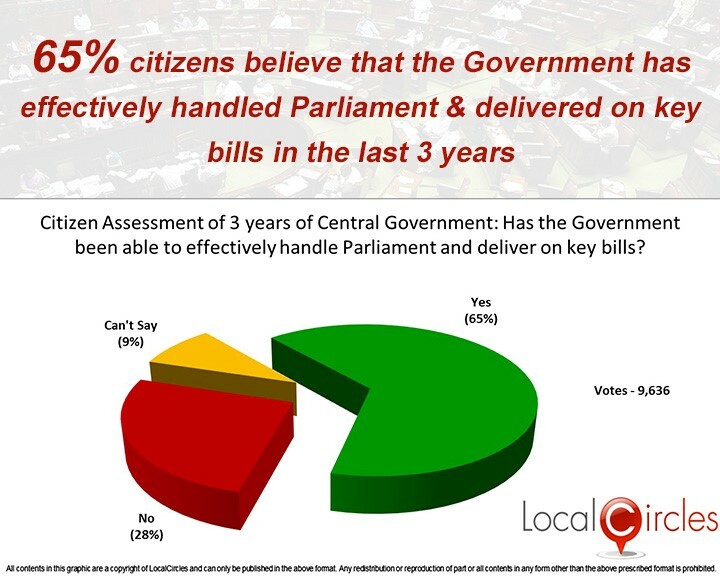 Therefore, 65% of the citizens say the government has effectively handled the Parliament and delivered on key bills. Passage of crucial GST bill happened in the third year, before which there were frequent log jams by the opposition in the Parliament. Government might have done well in some areas, but individual MPs still remain disconnected with their constituencies. 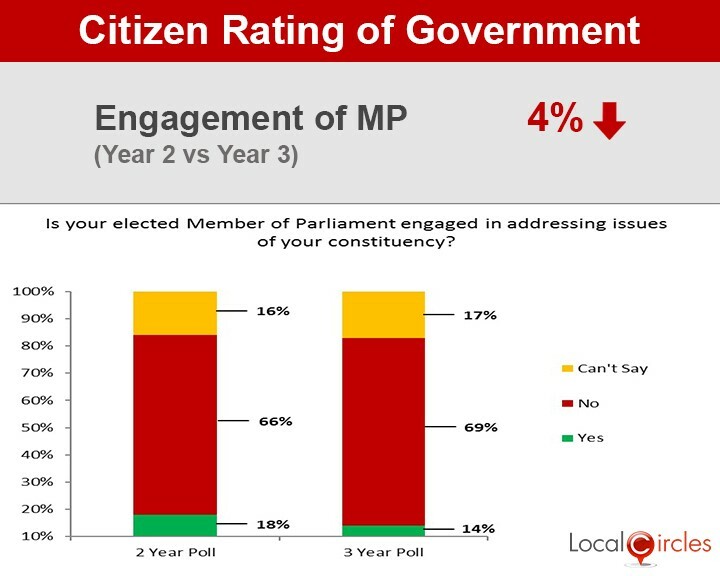 Around 69% of the citizens who polled say that their local MP is not engaged with the constituency. 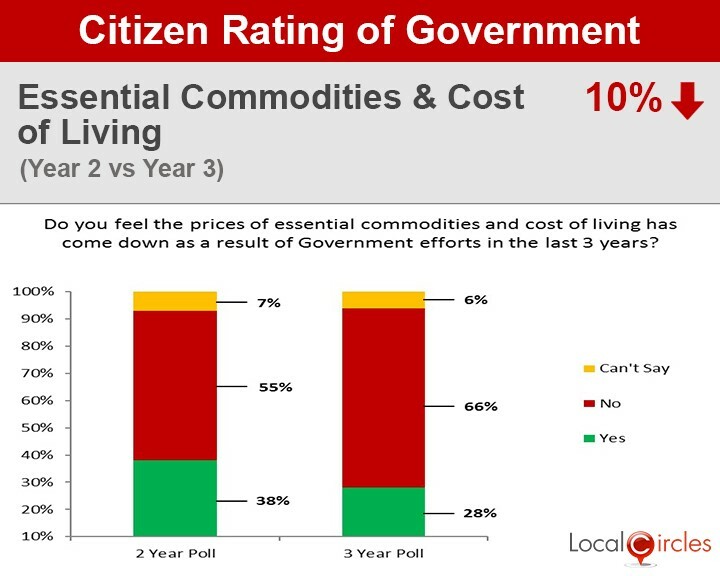 Around 66% of the citizens believe that the price of essential commodities and cost of living have gone up. This is in spite of the fact that inflation has come down to 3%. 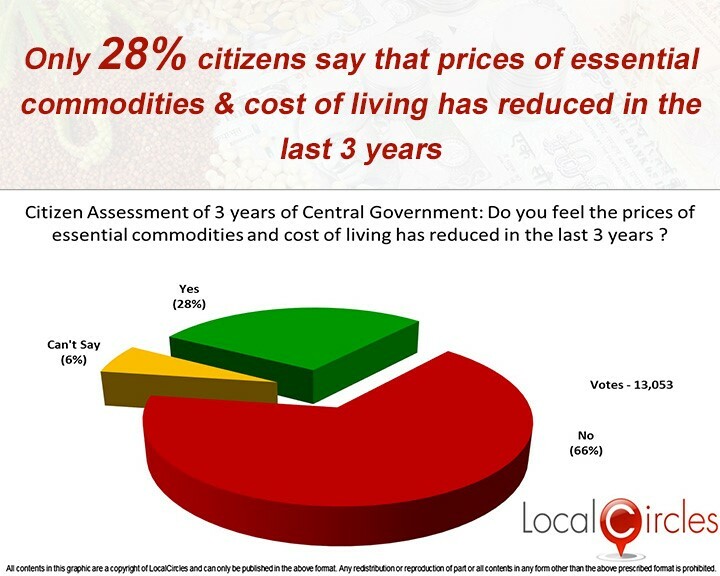 Only 28% of the citizens believe that the prices of essential commodities have come down for them. This is much lower than 38% citizens last year. This means there is difference between citizens’ perception and official inflation indicators. 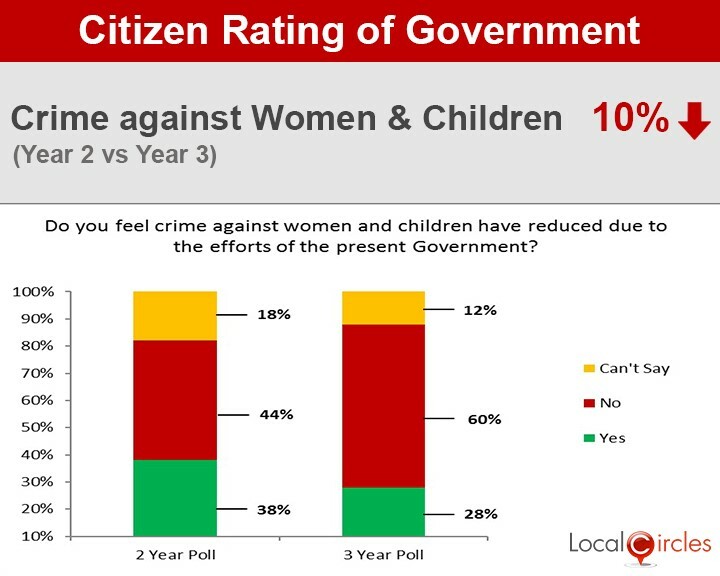 Only 28% of the citizens believe that crime against women and children has come down in the last one year. While police is not a central government subject, perception about safety is linked to central government. And 60% citizens believe that crime against women and children has not come down, this is up from 38% last year, a substantial rise. Indians, approximately 69%, remain optimistic about their family’s future in the country, though this percentage has come down from 76% last year. Only 23% citizens believe that healthcare facilities and services have improved in the last 3 years. Though, 58% did not agree with it and 19% said they were not sure about it. Health is a state subject but it has a huge role to play in quality of life of citizens. Though Swachh Survekshan 2017, released recently reported that 75-80% citizens find their cities cleaner, when asked whether their city had become cleaner in the last 3 years due to Swachh Bharat Mission, only 35% agreed with it, 57% disagreed with it and 8% were unsure. 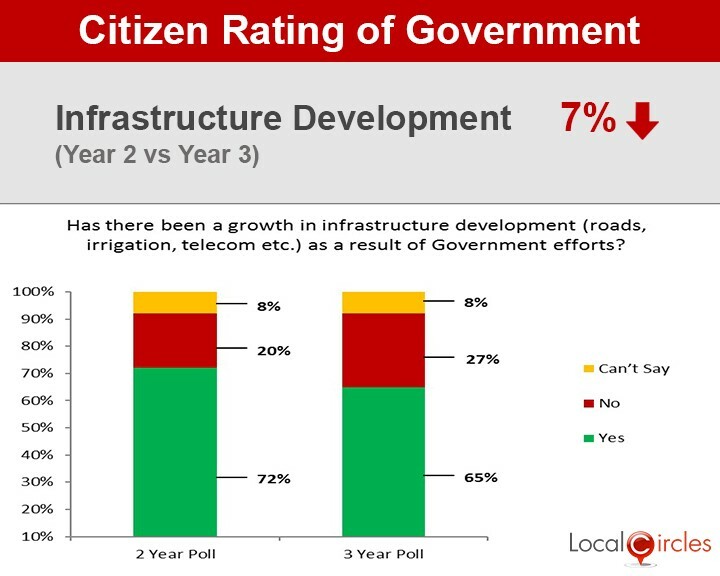 Around 65% citizens believe that new infrastructure development in the field of irrigation, roads, telecom etc. has taken place in the last 3 years. Only 27% voted negative and 8% were not sure. The number of citizens who felt that there has been a growth in infrastructure development as a result of the NDA has reduced from 72% last year to 65% this year. Citizens were asked if they felt that doing business had become easier in the last 3 years on which votes were divided. 36% citizens said yes, while 36% said no and 28% were not sure. This perception has changed from last year when 60% said that doing business had become easier. A large number of citizens 63% said the unemployment rate has not reduced, 21% said that it has definitely reduced and 16% were not sure about it. In last year’s poll, 43% people in 2016 said that the unemployment rate had not reduced in India under the leadership of the NDA Government. This year, this number has jumped up to 63%. There has been spate of layoffs in the e-commerce and IT sector this year, which were absent last year. New jobs are not being created leading to limited career opportunities and earnings growth for most professionals. Only 36% citizens believe that harassment by tax officials has reduced in the last 3 years. An equal number 36% said that tax harassment has not reduced and 28% chose not to comment. 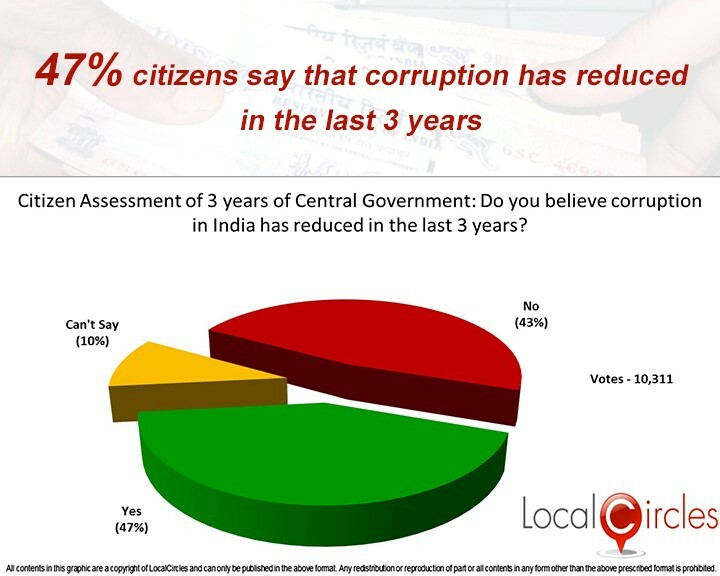 The general perception among 47% citizens is that corruption has reduced in the last 3 years whereas 43% believe that it had not reduced at all. While 10% chose not to comment. The Demonetisation of Indian currency of higher denomination was one of the biggest step taken by the central government to reduce corruption. When people were asked if corruption has reduced as a result of demonetisation, only 39% agreed with it. While 49% citizens said that corruption had not reduced since demonetisation and 17% chose not to comment. 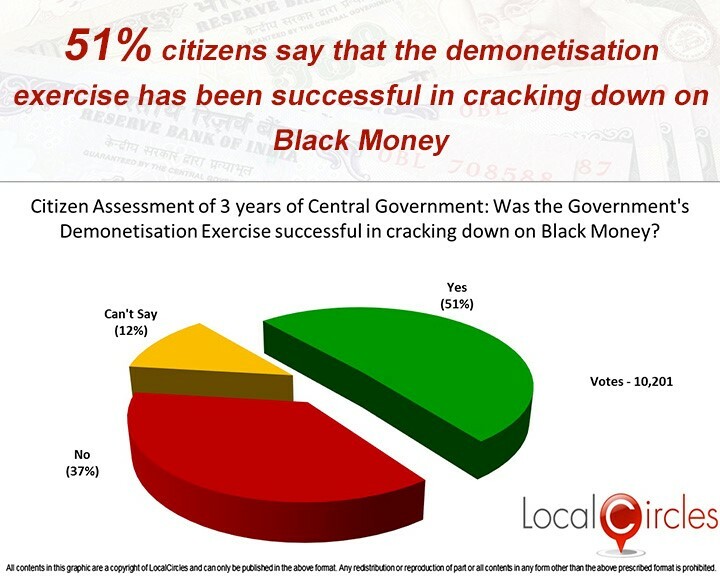 In the second question on demonetisation, citizens were asked if the demonetisation exercise was successful in cracking down on black money. A majority of 51% agreed with it. 37% disagreed with it while 12% were unsure about it. 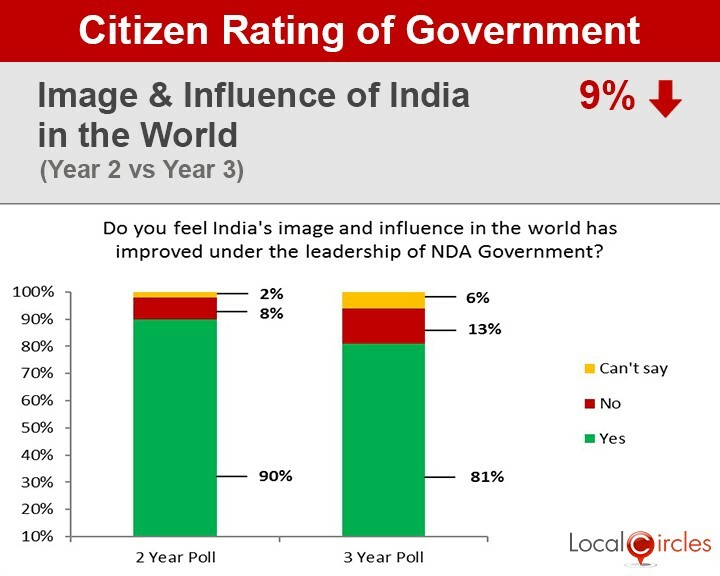 A massive 81% citizens feel that India’s image and influence in the world has improved under the leadership of the current government in the last 3 years only 19% did not agree with this while 6% were not sure. 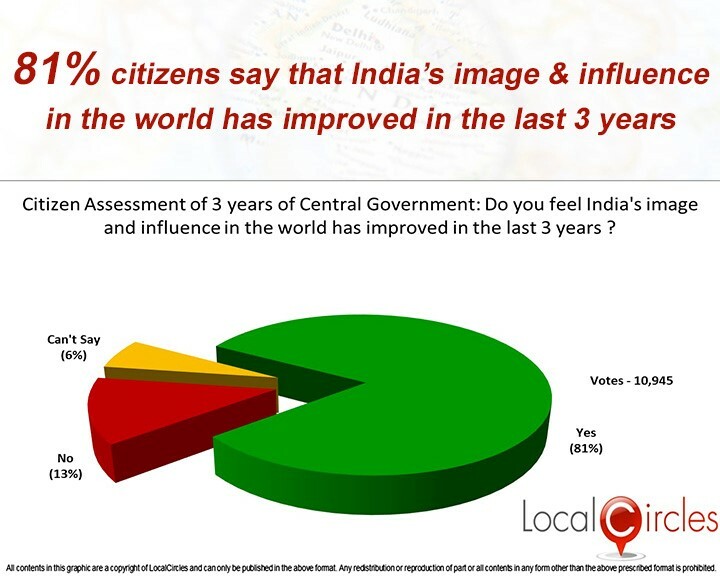 Last year 90% citizens believed that India’s image and influence in the world has improved though this number has come down, it is still a massive reaffirmation. Citizens were also asked if they approved of the way Government of India has handled Pakistan in the last 3 years. Around 64% citizens agreed with it. 30% did not approve of the Government’s methods and 6% were unsure. In the last year poll, only 34% citizens approved of the way India handled Pakistan. This number jumped almost 2-folds to 64% this year may be due to the surgical strike carried out by the government against Pakistan. Terrorism has been a huge issue in India for the last few decades. The current Government has taken some tough stance on terrorism in the last couple of years. 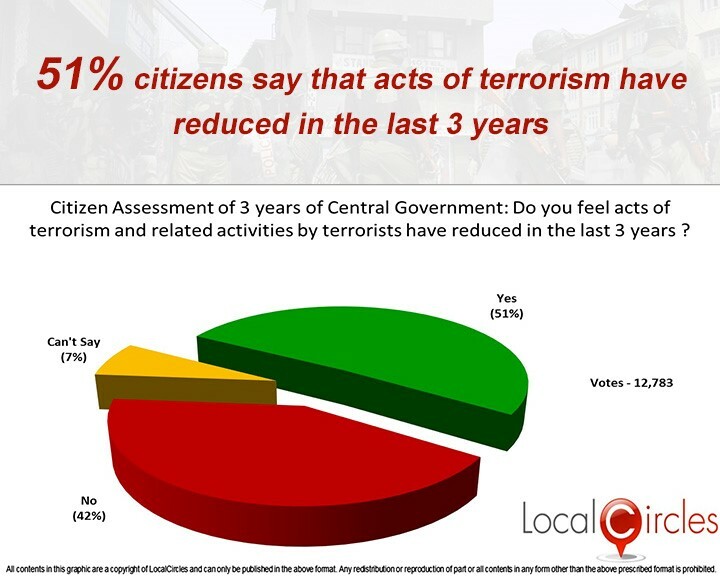 People were asked if they felt that acts of terrorism and related activities have reduced in the last 3 years. 51% citizens agreed with it, 42% disagreed with it and 7% chose not respond. In last year’s poll, 72% citizens believed that terrorism in India had reduced under the leadership of the NDA Government in the 2 year poll. The number slid down to 51% in this year’s poll. Around 61% citizens believe that issues related to communalism have been handled well by the Government in the last 3 years. While 31% believe that it has not been handled well by the current government. The question on communalism showed almost similar responses in the 2nd and 3rd years poll. Last year 63% citizens felt that communalism related issues were handled well by the NDA government. This number stood at 61% in this year’s poll. 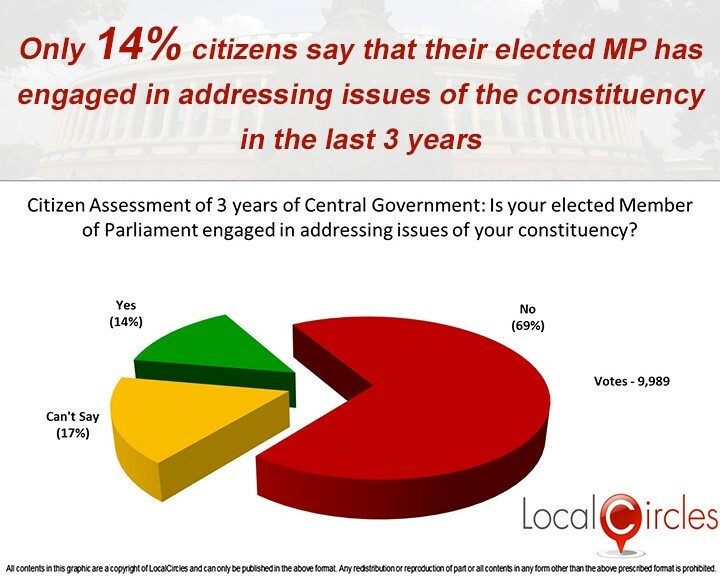 Out of the 9,989 citizens that voted, 69% citizens believed that their elected member of parliament is not engaged in addressing the issues in their constituency. Only 14% said that their MP was engaged with the constituency and 17% were unsure. In the 9,912 citizens, around 47% people believed that Direct Benefits Transfer was the most effective mission of the Government in the last 3 years. This was followed by 29% who said it was Jan Dhan Yojna, while 16% said Swachh Bharat and 8% who thought it was Make in India. This poll garnered a total of 9,912 votes. When asked is the Government has effectively been able to handle the Parliament and deliver on key bills, a majority of 65% agreed with the statement. 28% did not agree with it while 9% were unsure. A total of 9,636 votes were polled. 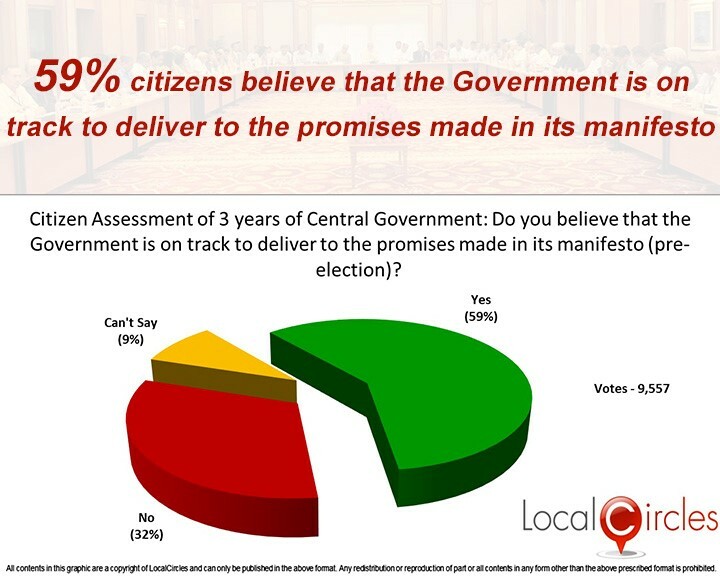 Citizens were also asked if they believed that the Government was on track to deliver to the promises made in its election manifesto. Around 59% citizens said that they were on the right track, 32% did not agree with it and 9% unsure. A total of 9,557 votes were polled on this question. Among 10,834 respondents, 44% citizens said that the government has met their expectations and 39% said that they were below expectations, while only 17% said that the government had exceeded their expectations in the last 3 years. The comparison of the 3 year performance with 2 year performance according to citizens shows a slight decline. In 2016, the combined percentage of citizens who said that the NDA Government met or exceeded their expectations was 64% which has declined to 61% this year. When asked if the citizens feel that the prices of essential commodities and cost of living had reduced in the last 3 years. Around 28% citizens replied in an affirmative, while 66% said it had not reduced and 6% were unsure. 13,053 citizens voted on this question. 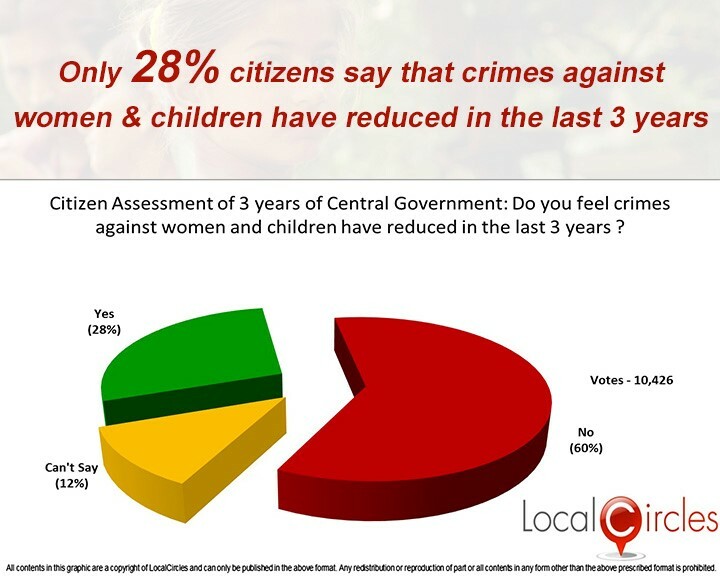 On this issue 10,426 citizens voted, only 28% of them said that crimes against women & children have reduced in the last 3 years. While a larger 60% disagreed with it and 12% were unsure. Last year’s poll showed that 38% people felt that crime against women and children have reduced under the current government. This number has declined to 28% this year which points out to the growing citizen concern about women and child safety and lack of sustainable initiatives to address this. Plus number of people saying that crime against women and children has not reduced has gone up to 60% this year from 44% last year. 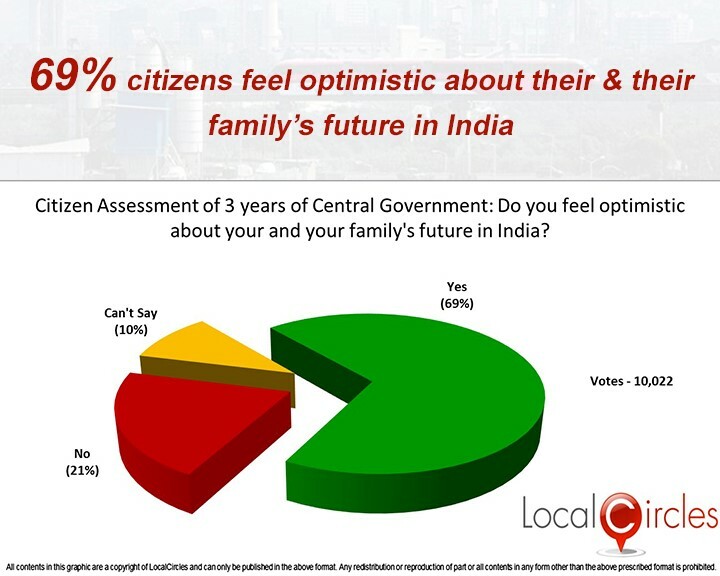 On the question if citizens feel optimistic about their and their family’s future in India, 69% answered in the affirmative while 21% were negative about it and 21% were unsure about it. A total of 10,022 people participated in this poll. 69% citizens this year feel optimistic about their and their family’s future in India as opposed to 76% last year. This shows a drop of 7% from last year. 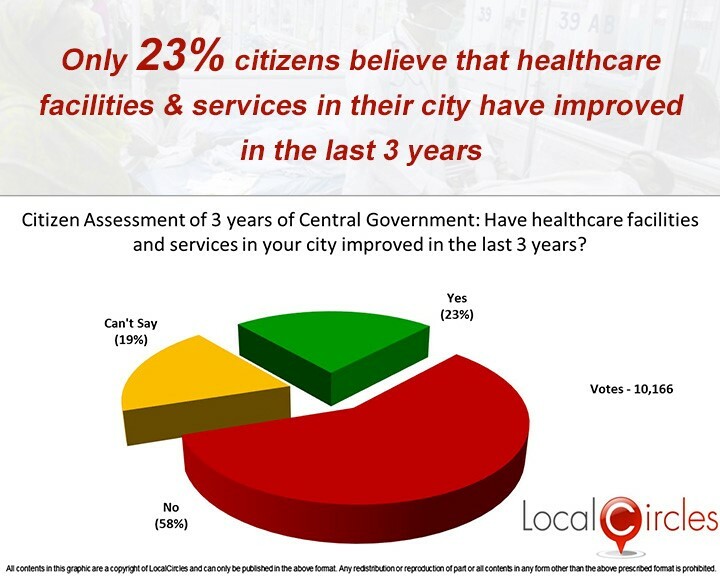 Only 23% citizens believe that healthcare facilities and services in their city have improved in the last 3 years. A large number of citizens 58% did not agree with it and 19% said they were unsure. 10,166 votes were polled on this question. Government’s Swachh Bharat Mission was launched in 2014 and according to people lack of municipal engagement had led to only limited success on the ground. Only 35 % citizens felt that their city had become cleaner in the last 3 years due to Swachh Bharat Mission, while 57% disagreed with it and 8% were unsure. 67% citizens in last year’s poll felt that their city had become cleaner due to the Swachh Bharat Mission. This number has plummeted to 35% this year showing that the effect of the mission is wearing off. The reduced number also shows that the local municipal bodies have not engaged in the mission effectively. 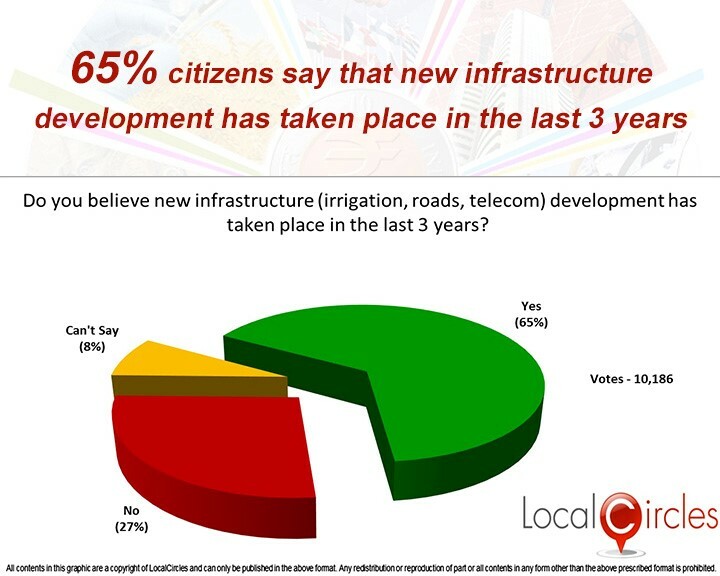 65% citizens believe that new infrastructure development in the field of irrigation, roads, telecom etc. has taken place in the last 3 years. 27% thought it was not the case and 8% were unsure. 10,186 votes were polled on this question. The number of citizens who felt that there has been a growth in infrastructure development as a result of the NDA government’s efforts has fallen from 72% last year to 65% this year. 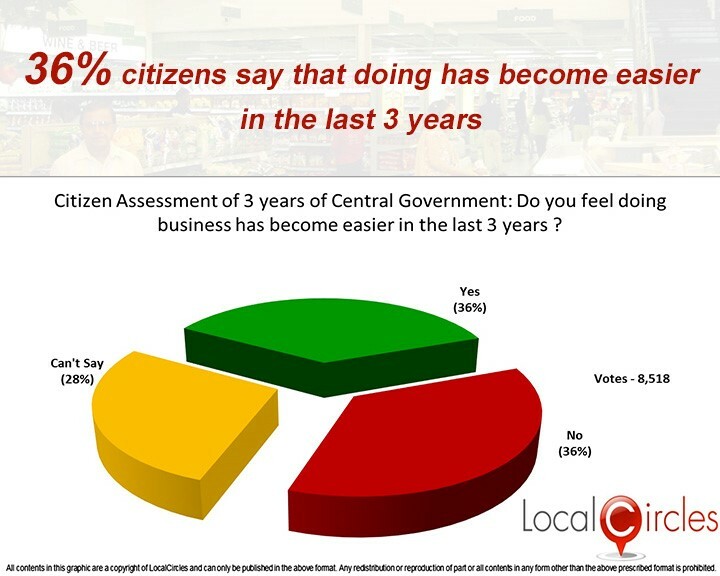 Citizens were asked if they felt that doing business has become easier in the last 3 years. Citizens are divided on this crucial issue. 36% citizens say yes, another 36% said no and 28% are unsure. 8,518 citizens voted on this question. Making doing business easy in India was another major initiative of the NDA government. People who felt it had actually happened were 60% last year. This year’s numbers have decreased sharply and are at 36%. 13,079 votes came in on the question about unemployment and if it had reduced in the last 3 years. A large 63% said the unemployment rate has not reduced, 21% said that it has definitely reduced and 16% were unsure. Only 35% people in 2016 had said that unemployment had reduced under the NDA Government. 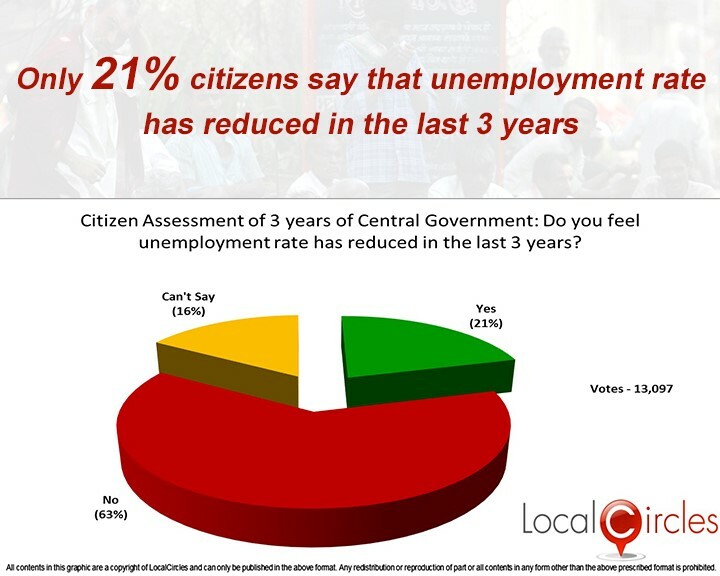 In the 3 year poll, this number was 21% indicating that an increased percentage of citizens now believe that Government is unable to address unemployment. Only 36% citizens believe that harassment by tax officials has reduced in the last 3 years. An equal 36% said that tax harassment has not reduced and 28% chose not to answer. A total of 9,906 votes came in on this question. 47% citizens say that corruption has reduced in the last 3 years whereas 43% say that it has not reduced at all. 10% are unsure. 10,311 votes came in on this question. The demonetisation exercise was one of the biggest moves of the central government since it came into power. When citizens are asked if corruption had reduced as a result of demonetisation, only 37% agreed with it. 47% voters said that corruption had not reduced due to demonetisation and 16% were unsure. 9,110 responses came on this question. In the second question on demonetisation which got more than 10,000 responses, people were asked if the exercise was successful in cracking down on black money. A majority of 51% agreed with it. 37% disagreed while 12% were unsure. A mammoth 81% citizens feel that India’s image and influence in the world has improved under the leadership of the current government in the last 3 years. With a total of 10,945 votes coming in on this poll, only 19% did not agree with this while 6% were unsure. As opposed to 81% who feel that India’s image and influence in the world has improved in the last 3 years, 90% felt the same last year when the government completed its 2 years. Citizens were also asked if they approved of the way Government of India has handled Pakistan in the last 3 years. 9,980 responses were received and 64% citizens approved of it. 30% did not approve of the Government’s methods and 6% were unsure about it. In the 2 year poll, only 34% citizens approved of the way India handled Pakistan. This number jumped almost 2-folds to 64% this year due to the strict measure taken by the government in the last 1 year. Terrorism has been a huge issue in India for the last few decades. The current Government has taken some tough stance on terrorism in the last couple of years. In one of the polls people were asked is they felt that acts of terrorism and related activities have reduced in the last 3 years. 51% citizens agreed with it, 42% disagreed with it and 7% chose not to answer. This poll received 12,783 votes. 72% citizens believed that terrorism in India had reduced under the leadership of the NDA Government in the 2 year poll. The number slid down to 51% in this year’s poll. 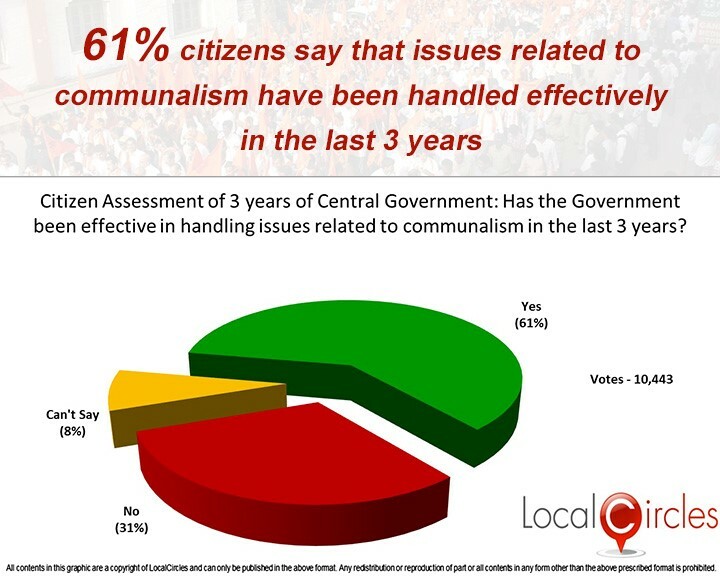 61% citizens felt that issues related to communalism have been handled well by the Government in the last 3 years. 31% feel they have not been well handled by the current government. With 10,443 votes being polled, 8% citizens were unsure. The question on communalism showed almost similar responses in the 2 and 3 years poll. 63% citizens last year felt that communalism related issues were handles well by the NDA government. This number stood at 61% in this year’s poll, a drop of 2%. 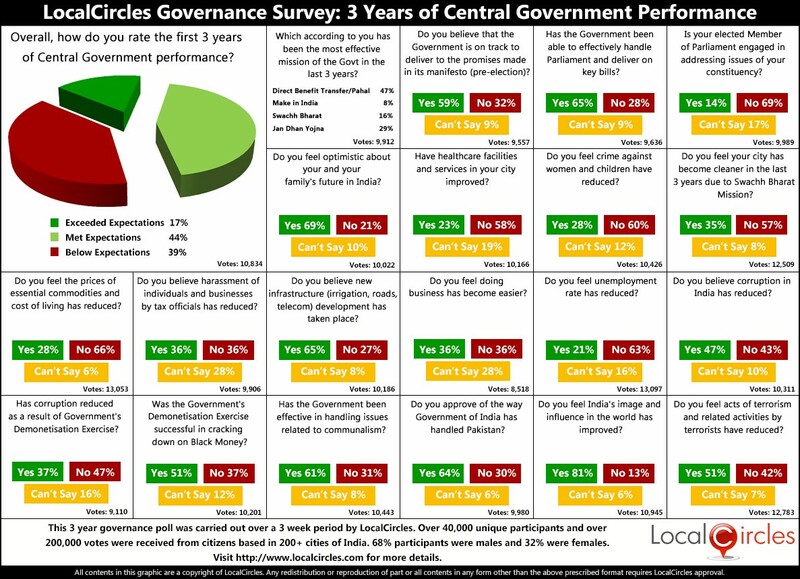 The national survey on three years of Central Government was conducted on LocalCircles, India’s leading citizen engagement platform to gauge the impact and performance of the Central Government. The objective was to understand what’s working and where efforts need to be put in going forward. 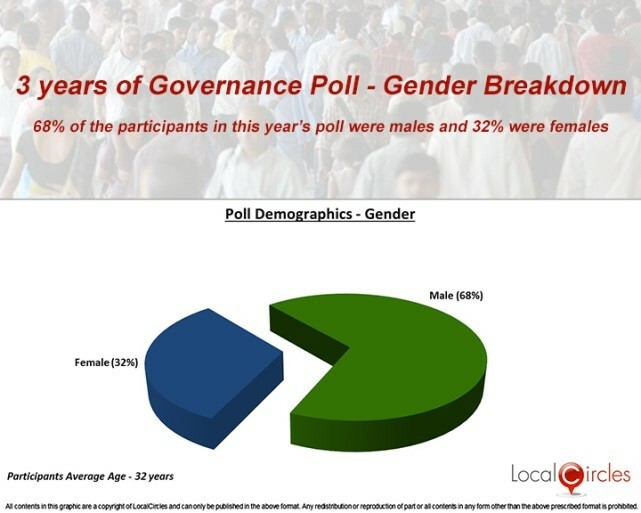 Over 40,000 unique citizens participated in the polls and over 200,000 votes were received in the survey thereby making it one of its largest surveys of its kind. Each citizen who voted in thee survey is registered with LocalCircles with their detailed information and in many cases shared their exact residential address. Approximately 68% of respondents were males while 32% were females. 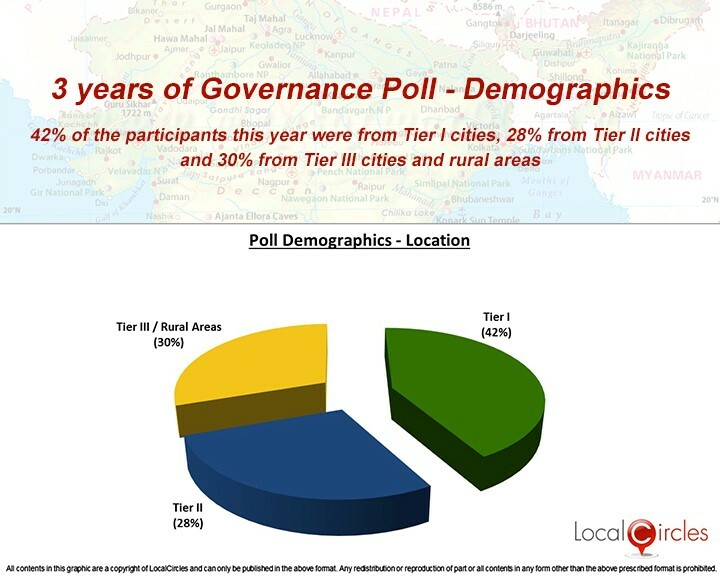 Approximately 42% of the respondents were from Tier 1 cities, 28% from Tier 2 cities and 30% from Tier 3 cities and rural locations. The average age of the poll participants was 32 years.